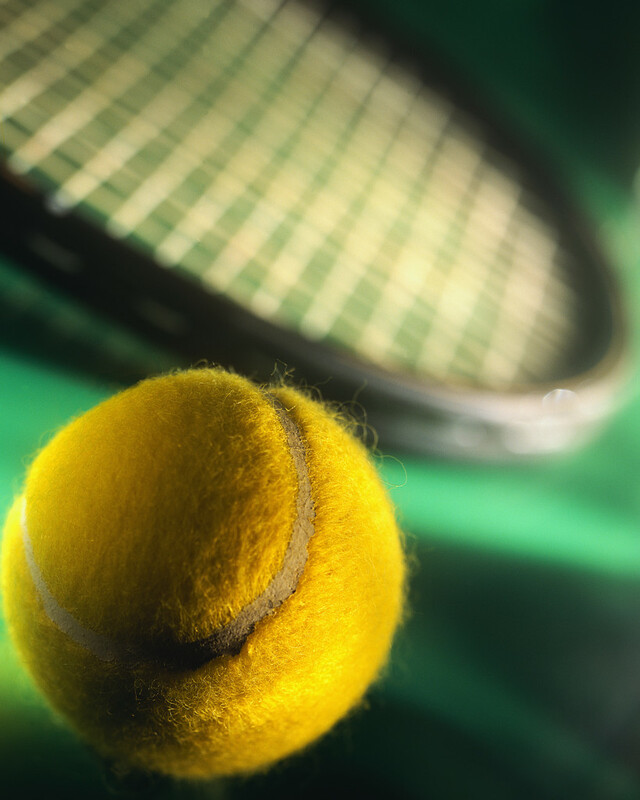 There were bizarre moments for brands at this year’s French Open tennis tournament. Novak Djokovic smashed his Perrier player’s bench in frustration over Rafael Nadal’s strong start. The French bubble-water-maker nevertheless was prepared, and a new bench, with a pristine Perrier logo, debuted during a rain delay. It’s a lesson watchmaker Longines could learn from. Longines is the official timekeeper of the French Open grand slam with branded Longines clocks tracking match time at both ends of the court. One of the digital Longines timekeepers went a bit wonky early in the two-week run at Roland Garros, blinking erratically. Perrier could very well have left its busted bench on court through the rest of the final. No one confused Djokovic’s attack on the bench with the brand – it was all about how he was playing in the first two sets. And the smashed logo wasn’t associated in any way with the Perrier product itself. But that demented flashing clock! It’s hard to imagine it wasn’t a distraction to the players. For that reason alone, Longines should have gone out of its way to repair the thing. But the primary reason to fix the clock is that it isn’t just a brand logo, it’s one of their timepieces, a demonstration of the quality of their brand. Brands sponsor sporting events to draw attention to themselves at a time when millions upon millions of viewers are tuning in. But this isn’t the kind of awareness they want: Look! Our clocks don’t work! From Los Angeles Times coverage of the Mills strike. 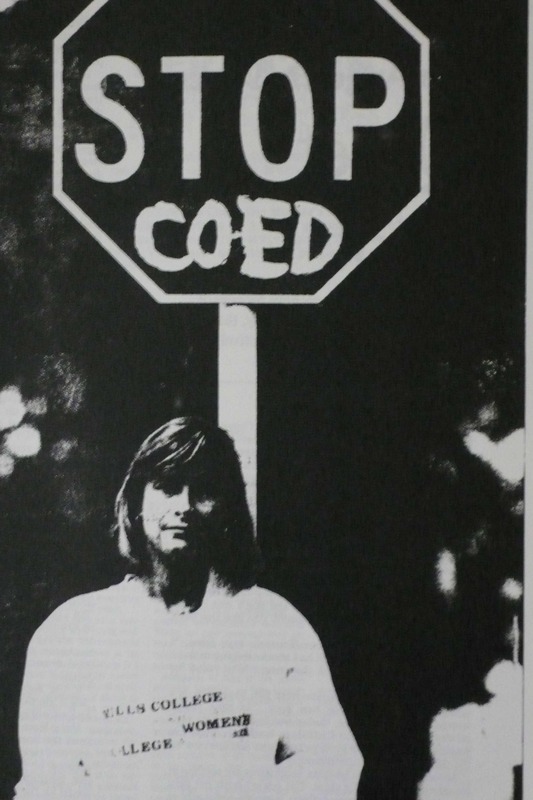 On May 3, 1990, Mills, a small women’s-only liberal arts college in northern California, decided to go coed and, much to the delight of media outlets and pundits, the students struck back and shut down the school for the rest of the semester. The events of those two weeks swept Mills and Mills women onto front pages and TV talk shows around the world. When you are the public face of an organization dedicated to women, how do you avoid getting caught in that feedback loop? Is it possible, in a world where TV talk show hosts dismiss proponents of women’s equality by calling them “femi-Nazis,” to receive fair coverage? Journalist Linda Ellerbee calls feminism “the new F-word,” an appellation so contentious that even women who’ve risen to the top of their professions feel they must assure the writers of magazine profiles that, No, they most certainly are not feminists. Two decades ago, the students of Mills College in Oakland, Calif., were blocking access to campus administration buildings, behaving like anything but doormats. They were protesting the board of trustees’ decision to make the all-women’s college coed. I was one of two spokeswomen responsible for explaining to the world’s media why they opposed the admission of men. When the coed announcement was made to the Mills community, scores of students were filmed and photographed sobbing. Although many couldn’t understand why Mills women were crying, the reaction managed to pigeonhole them into one of the typical roles allowed to women in news stories. They were the perfect victims. It took only a few hours for students to move into strike mode and effectively shut down the college. But, when the students threw off the victim mantle and took a stand on keeping Mills for women only, the headlines, letters to the editor, opinion pieces, and cartoons turned absurd and nasty. Amongst the condescension there was a strong undercurrent of anger. A few even suggested the students should be punished. 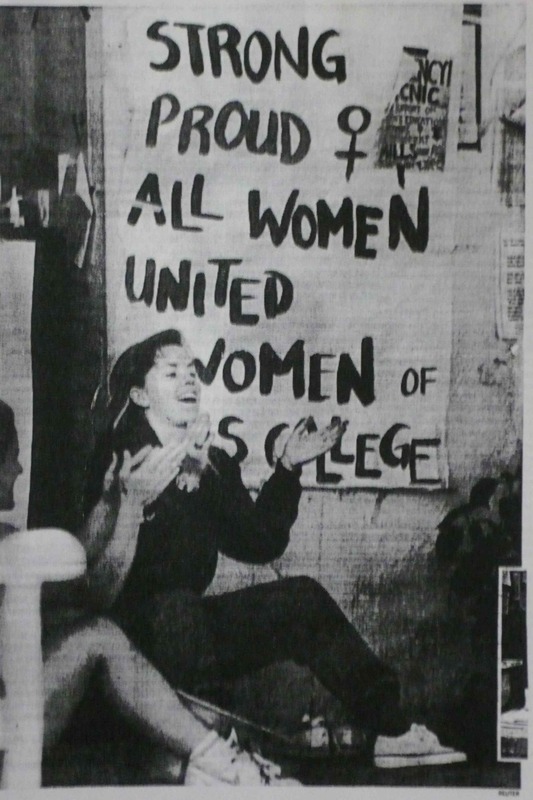 In this uncomfortable climate – with some reporters panting for a confrontation between students and police – you’d think it would have been impossible to come off sounding rational in news reports while discussing the benefits women’s colleges offer female students. How did we handle it? From the moment we heard the first mention of “coeducation” as one of four possible strategic directions for the future of Mills College, we knew that only a proactive approach would allow the Mills message to be heard. Our first press release went out more than eight months before the trustee decision. We spent whole days talking with reporters who arrived on campus (some with fairly sensationalistic preconceptions), spoke with students and professors, and left with a greater understanding of women’s colleges. 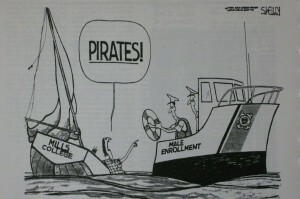 In an educational environment, we set out to teach about the many studies which show that coed colleges offer women fewer chances to become leaders in and out of the classroom and why, given that research, Mills would consider the possibility of admitting men. During the months before the decision, we were repeatedly rewarded with intelligent media analyses of the coed debate. Even in the midst of the two-week protest, persistence, patience and the educational approach tamed the most objectionable inquiries. The pre-work we’d done ensured reasoned stories from reporters who’d met students, faculty and trustees before the decision. They discussed why women’s-only education was important to defend. It was the reporters – and editorial cartoonists back at the paper – who dipped in to the story after the tears who didn’t always offer balanced coverage. What they accomplished – overturning the coed decision – has never been done before in the history of U.S. education. It caused women’s colleges that were thinking about coeducation to re-evaluate, strengthening their resolve to continue to offer a curriculum for women only. After the Mills revolution, other stories, such as the Clarence Thomas confirmation hearings, received wall-to-wall coverage. 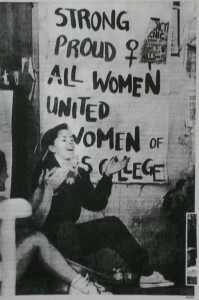 In the years following the strike, I noticed more women giving testimony in the news media about the empowerment they’ve received because of the fight for women’s equality. In fact, if you’re a woman, and you’ve ever told someone you feel “empowered,” you probably have Mills women to thank for that particular vocabulary choice. For two solid weeks, empowerment was at the heart of the students’ messaging to the world and, with all that media attention, “empowerment” did the 1990s’ equivalent of going viral. Nike even created an ad campaign aimed squarely at women, all about empowerment (and sneakers). This is not to say that 777 Mills students are entirely responsible for the resurgence of feminism and the support of equality and empowerment, but there’s no denying they were out there at the forefront, pushing women’s issues back into the public arena at a time when most politicians, reporters and even feminists were trying to sweep them under the doormat. Some fascinating developments in last week’s big Twitter miscommunication stories. On Thursday, I published this post about Rep. Anthony Weiner’s Twitter fallout and the gaffe by a PR pro, who was defending his client. Since then, The New York Times has done some digging (reported in this excellent article, “Fake Identities Were Used on Twitter in Effort to Get Information on Weiner”) and discovered that Weiner’s Twitter account appears to have been monitored by political opponents, that people using fake Twitter handles (i.e. not their real names) were trying to engage him in online conversations, and they were contacting young women Followers of the congressman to try to learn more. In an effort to provide deeper insight into the Redner Group’s upset Tweet about reviews of its client’s game that went “too far,” Jim Redner has written a lengthy guest column for Wired dissecting what happened, why he wrote the Tweet and how he goes about selecting the media outlets that receive a few hundred free review copies provided by the gaming company. I don’t know of anyone worth their salt in the PR, corporate communications, marketing or news business who hasn’t had something blow up in their face at some point in their career, especially early on. Whether it happened on camera, in print or in a client’s office, these are the moments that we learned from, generous peers forgave us for, and, after incorporating this new knowledge into how we practiced our craft, made us better, wiser professionals. After these stories hit the presses last week, the two pieces of advice I offered to individuals, communications folks and brands were: Never assume you know your Followers (mainly related to Rep. Weiner’s concerns) and Never confuse your professional Twitter account with your personal account (relating to the Redner Group story). To these I’d like to add: Be careful how you choose to engage. The reason most of us – as individuals or companies – are using social media is to engage audiences large and small. Often that means an auto-Follow back when people Follow or Friend us. On Twitter accounts belonging to public figures, you frequently see Followers request ReTweets. Sometimes these have to do with asking support for charities or help finding a missing person, other times they’re like reading ancient Greek. Companies are often lauded for responding with the same empathy as humans, so it is understandable that some might want to ReTweet about a missing person or promote a good cause. However, some of these requests may not be about genuine nonprofits or real missing people. Do you or your company have the time and resources to investigate every one of these requests to ensure that the information on your Twitter account is reliable and accurate? And doesn’t your reputation, or your company’s, depend in part on the quality and accuracy of the information it shares? Note that social media influence, as tallied by tools like Klout, is based on the frequency of your online engagements, and being ReTweeted by someone with a large Klout score – someone like a celebrity – will boost your score even higher. So Twitter users aren’t always engaging with your or your brand to be friendly; in some cases, there’s a self-serving interest. Then there are the Direct Messages that some choose to reply to and others clearly have a policy of not responding. While I would never encourage a company to ignore a DM that related to a customer service issue, responding to DMs can get you in trouble if you don’t know the person making the request. Remember that the concern is not only this individual (who may not be who they say they are), but everyone else who can view one or both sides of the conversation, and it doesn’t even depend on who they Follow, rather it’s determined by how much reading of your Twitter stream and your correspondents’ they want to do. For companies and brands, establishing guidelines around conversations with Followers and Friends is a must. Thinking through why you might or might not want to engage in DMs or RTs with Followers you may or may not know – and what one RT might invite in terms of requests for others, and whether you can handle the volume – will go a long way to maintaining a consistent and positive online presence and help protect brand reputation. So, be extra careful with your online and social media presence and engagement practices because you never know who you’re talking with and you really never know who may be lurking out there. Bloomsday dawned gloomy here in Hollywood, where we are “suffering” through the annual fogbound weather pattern known as June Gloom. It’s the one month on the calendar when we Angelenos are socked in like San Franscisco is the rest of the year. the loss of an account by PR agency Redner Group following Tweets that suggested the flacks would blacklist some media outlets that chose to give their client, gamer 2K, and its latest offering “Duke Nukem Forever,” less than favorable reviews. 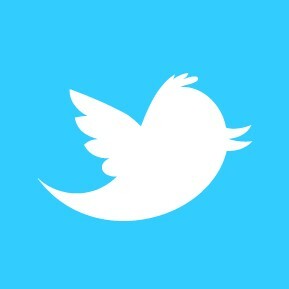 How Do You Solve a Problem Like Twitter? It’s a good question because it seems like two highly keen advocates of microblogging as a means to promote clients and causes and generate grassroots endorsements – those would be the PR industry and politicians – truly do not understand how the channel Twitter actually works. Have no fear, I’m not going to add to the commentary on the Weiner affair. I only want to explore what I and you and anyone supporting Twitter accounts for ourselves or a company or client can learn from this mess. It seems to me that one key lesson is something our mothers tried to teach us years ago: Don’t talk to strangers. On Twitter this means we may all need to let go of the little ego rush (hey, I get it, too; doesn’t mean it’s right) that comes with adding new Followers. Face it, if you don’t know these folks and their profiles indicate they aren’t even in the same industry, what’s the point? What benefit do you or your clients really get from having random Followers? As with using impressions to measure success for media hits, measuring Followers does not give you an accurate reading of your influence. Ordinary people do not have confirmed Twitter accounts. Confirmed accounts are the ones with the blue badge next to them featuring a white check mark; you’ll often see these on the Twitter accounts of celebrities, companies or public figures. Former Rep. Weiner has noted that he was using Twitter to communicate with women he’d never met and didn’t know. Here’s the thing: You can never assume that someone is who they say they are on Twitter. Some accounts – that go a long way to make it look like there are real people behind them, including using a photo of a pretty girl, cleverly written profiles and Tweets copied from other accounts to appear friendly and real – aren’t even run by people: they’re spammers. And some accounts may even be ruses by people who don’t have your best interests at heart, people like competitors, who try to draw you in to compromising conversations. I’m not, if you’re wondering, suggesting that Rep. Weiner was blindsided deliberately. I’m positing the idea that it is to our advantage (and our clients’) if we know whom we’re engaging or enraging on a public forum like Twitter and, if we don’t know who a Follower is, that acting, as crisis consultants often do, on a worst-case scenario basis might be a better approach than giving an unknown an all-access pass to our personal thoughts, opinions and photographs and, with them, the ability to damage reputations. The Redner group Twitter incident appears to be one of those cases where personal reaction to bad reviews was vented on the same Twitter account used by the company. Presumably this company Twitter handle also was used to promote clients, which is a standard practice in PR, and done in the hopes that Followers who are journalists might be further enticed into doing stories. In this instance, they certainly were. James Redner told Ad Age: “I used a public forum to voice my complaints and I know better.” He also said he made personal calls to media outlets to apologize and explain, which was the right thing to do. Still, the situation reflected on the client, which ended its relationship with the company. It’s important to mention that emails between PR people/spokespeople and reporters have wound up everywhere from Twitter to blogs to TV news, which is to say that mistakes in one channel (email, which some might think is a more private channel) can find their way to other, far more public channels with many, many more viewers and readers. If you’re writing in a highly personable style on your company Twitter account or on a client’s – or if your personal Twitter account uses a handle that’s easily recognizable as you (because reporters can find and read and make use of your personal account whether you think that’s fair or not, and Human Resources departments are doing across-the-board social media searches on prospective candidates) – never confuse being casual with saying anything that’s on your mind. A friendly writing voice is a stylistic choice made on behalf of you, your company or your client(s), it’s not real (and therefore at the service of anything you feel like saying). Your friendly writing style is all about branding and ultimately about maintaining a good reputation. If you want to share highly charged feelings or opinions, it is perhaps wiser to use a journal or…I was going to say take them on a Bloomsday pub crawl, but in this era of Twitter and video cameras on cell phones, even that isn’t a safe bet anymore. It’s probably best to take your anger home with you and vent it there in private.